Last Updated: April 17, 2019 · Published: March 12, 2018 By: Asian Caucasian Leave a Comment This post may contain affiliate links or sponsored content. 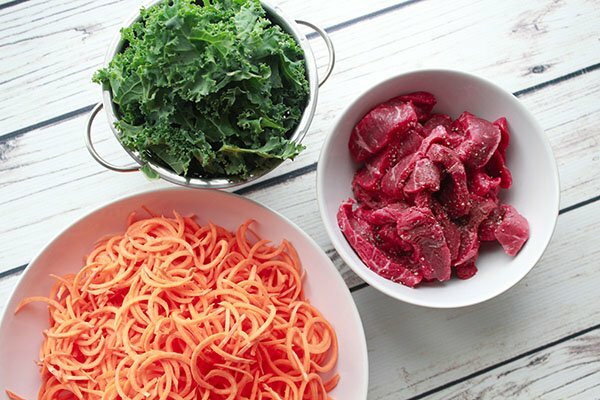 Do you have a spiralizer gadget yet? This is one great modern invention! 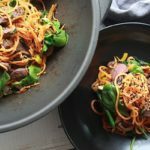 I’ve spiralized sweet potatoes for this recipe and they taste amazing, hold their texture, and are a super healthy substitute for Asian noodles. 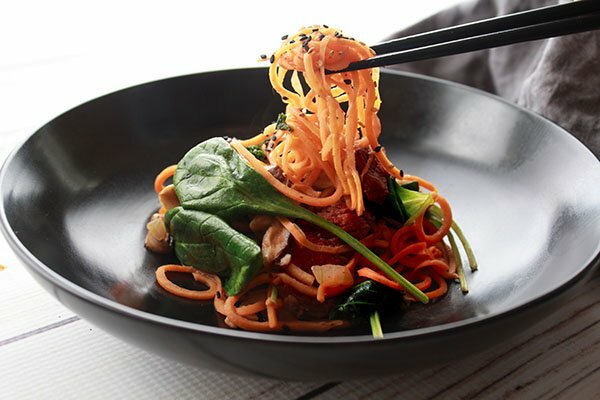 Especially in this dish — Korean Sweet Potato Noodles with Beef! First, get yourself a decent veggie spiralizer with a crank, like this one. Don’t use a manual hand spiralizer or you’ll get cramps in your wrist. Not good, unless you want an arm workout! This recipe is incredibly flavorful and loaded with healthy ingredients like shiitake mushrooms, green onions, garlic, red peppers, kale, and spinach. Not to mention the benefits of healthy sweet potatoes! It’s the sauce that’s the flavor kicker here. Seared top sirloin strips are the protein, and it’s all sautéed with a Korean-inspired sauce of spicy Gochujang paste, honey, soy sauce, sesame oil, and rice vinegar. Sprinkles of black and white sesame seeds are the finishing touch. So what are you waiting for? Get spiralizing!! 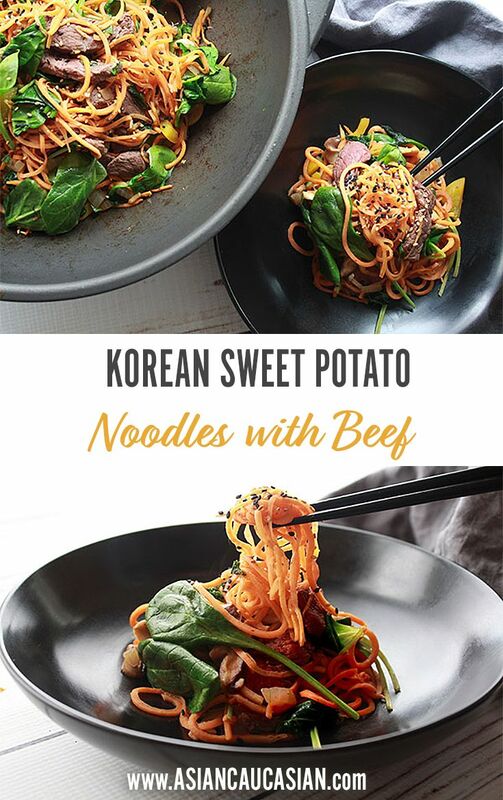 Such a colorful dish, this Korean Sweet Potato Noodles and Beef recipe will be something you’ll want to make again and again! Get yourself a good spiralizer, like this one. You will thank me! The manual spiralizer gadget will make your hand cramp up! Gorgeous hues of orange, green, and red are so colorful in this dish! 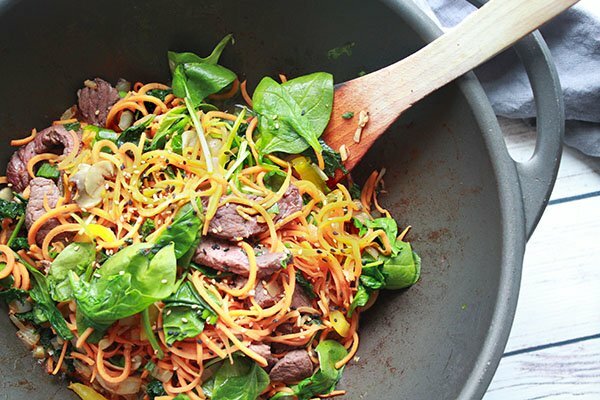 Tender slices of top sirloin are perfect in this stir-fry dish. Take care not to overcook the meat. The sweet potato noodles are such a healthy substitute for Asian noodles. Prepare the sauce: In a small mixing bowl whisk together all of the ingredients. Set aside. 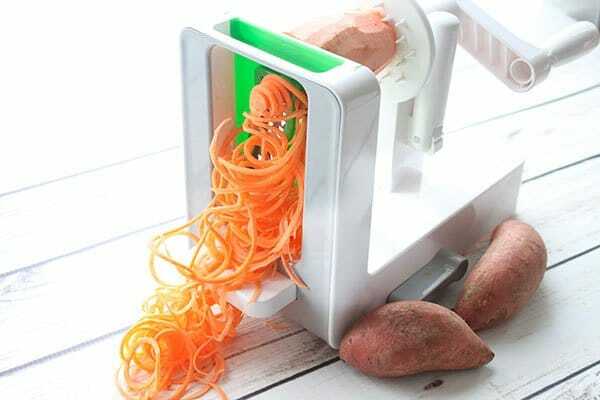 Using a vegetable spiralizer, spiralize the sweet potatoes using the small blade. Set aside in a large bowl. Heat a heavy wok with 1 tablespoon canola oil on medium-high heat. Quickly stir-fry the beef to brown, about 2 minutes. Add a pinch of salt and pepper. 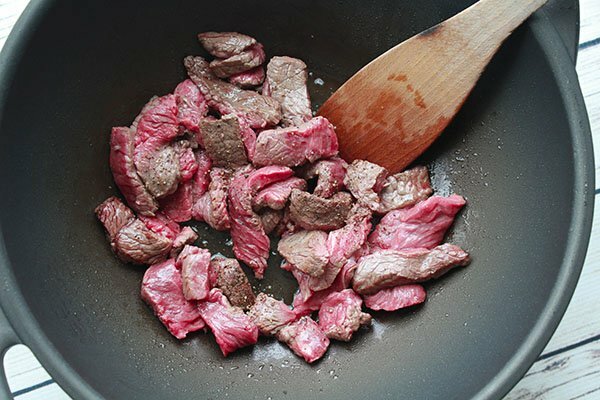 Transfer beef to a bowl and set aside. Wipe out the wok and add the other tablespoon of oil. Heat on medium-high and add in the garlic, onion, and bell pepper. Stir-fry for 2 minutes. Add in the mushrooms and stir-fry another 2 minutes. Add in the spiralized sweet potatoes and cook another 2 minutes. Add in the kale and cook until wilted, about 2 minutes. Add in the baby spinach, green onions, and beef. Stir in the sauce and cook until just done, about 3 more minutes. Serve with sprinkles of sesame seeds. 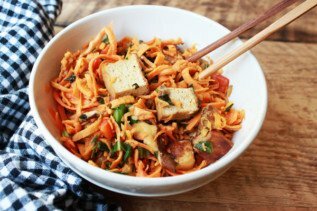 If you liked this recipe, try our Sweet Potato Noodles with Tofu and Spicy Peanut Sauce.